While the Africa Twin was in getting some work done on it (new wheels and centre stand circlip) I was given Honda's wee CB500X as a courtesy bike. I've heard good things about these wee bikes but to me it just sounded like is was going to be a bit bland and gutless. I'll be honest, I thought it was going to be shite. Well, maybe shite is the wrong word. "Just another bike" is maybe a better way to describe my expectations. I was handed the keys and I stepped outside the shop where I seen the bike I'd have till the next day. This particular bike had seen better days. It still had the scars up once side from a previous customer's calamity. Still, it's way better than getting the bus. A quick squint round the bike showed some surprising features. It's got a decent LED headlight and preload adjustment at both ends, something that can be missing from bikes nearly double the price. I fired it up. It sounded more like a bubble machine than a motorcycle. Ergonomically the bike was good, enough space and comfort for my 6'4 body. It's heavy for a wee bike, tipping the scales at 195kg but it really doesn't feel it. Filtering through traffic was easy. I had enough grunt to nip away from the lights and enough brakes to avoid any unexpected arseholes trying to kill me. Once out of the toon the CB500x started to grow on me. My first "big bike" on the road was a CB500s. The younger CB500x doesn't seem to have the go my old bike did but still nips along well enough on the dual carriageway, the wee screen giving enough protection to keep the wind off my chest. The twisty country roads was where my JAB expectations were blown away. 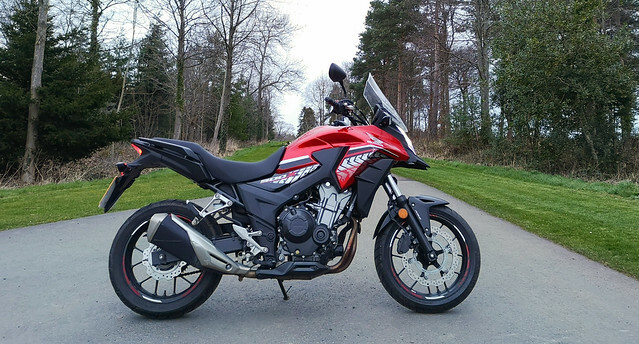 The wee CB500x was great fun! The handling gives plenty confidence when chucking it through the corners. You have to boot the arse out it a bit to keep it going, while the engine didn't spend the whole time at the top of the rev range the throttle was wide open. This added to the fun! The engine has decent midrange poke giving some steroids to the 47 or so horses it produces. This bike isn't a shitey, drab commuter bike, its a great laugh. Chuck some luggage on it and you'll be able to tour with any bigger bikes with no problems. Don't get me wrong, I'm not going to sell the Africa Twin and get a CB500X anytime soon, but it show that while it's nice to have a big, powerful bike to travel on you can still have plenty fun at half the price.